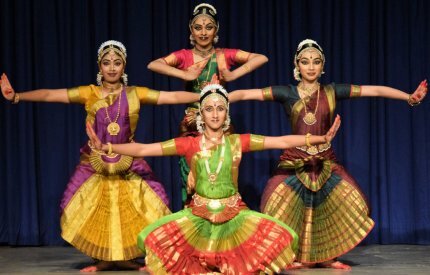 The ghungroos reverberated at Bangalore Gayana Samaj for four evenings as different dancers graced the stage with their splendid dance performances held in connection with the annual Nrithyotsava. The festival was inaugurated by veteran connoisseur and patron of arts Dr.R.V. Raghavendra. The first evening commenced with an impressive Bharatanatyam recital by Rakshitha Prasad trained under Prof. M.R. Krishnamurthy of Kalakshithi and Kalakshetra fame. She impressed the audience with her nimble footwork and animated facial expressions. Varnam in Dhanyasi raga (Eemaguva, Mysore Sadashivarao) sketches the virahotkhantitha nayika questioning her patron King Krishnarajendra Wodeyar and pleads for his grace. Rakshitha went through the deliberations with artistry and was applauded for her tidy nritta and abhinaya. The Devaranama (Baro Krishnayya, ragamalika) and ashtapadi (Nindati chandana) in Darbari Kaanada brought out her acting abilities. The skilled Bharatanatyam dancer and Guru P. Praveen Kumar was energetic and electrifying, drawing warm response from the audience with his spirited presentation that reflected his artistic brilliance. His students also performed and did their guru proud. The traditional alarippu and the depiction of the traits of the Devi on the basis of Sri Shankaracharya's verses and navarasa exuded by her character when coming into contact with Lord Shiva stole the show. The formation of groups ending in freezes delighted the eyes. 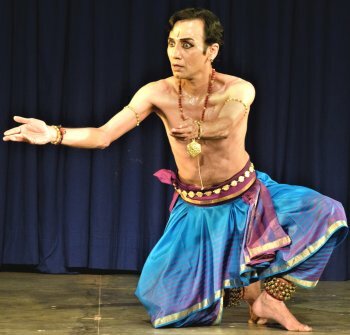 Praveen gave a sterling performance as he demonstrated the nuances of chaste Bharatanatyam when he explored a few excerpts of shlokas of kavi Shuka to sketch the leelas of Sri Krishna. His facial expressions were exemplary. His deeds of protection of the good and annihilation of the evil were enacted with ease and poise. It was delicate yet fierce in its presentation. The anga shuddhi and laya siddhi were commendable. Veteran dancer Padmaja Suresh dazzled in her thematic presentation entitled 'Sarvam Lalitharpanam,' an outcome of her research. Mahakavi Subramanaya Bharathiar's Chinnamchiru kiliye song describing the love of a mother for her child was aptly and meaningfully chosen and presented as a salutation to the mother Devi. A small hymn (Agastya's Sri Chakra Simhasaneshwari) was rendered by the students of Padmaja adding to the ambience of Sri Lalithopasana. She saluted Adi Ganesha and Adi Parashakthi on the basis of a Jayachamaraja Wodeyar krithi, Sri Maha Ganapathim (Atana). The Gayana Samaj audience was swayed by the colourful lighting, stage management and an all energetic Kathak through its fast-paced footwork, indefatigable spirals and various tora tukda, chakradars, ladis etc created by the popular Kathakar couple Nirupama and T.D. Rajendra. The opening pure dance piece Tarang, brought out the salient features of their mastery over the medium. The waves of laya undulated in varied patterns of 3-4-5-9 et al and the engrossed dancers accounted for an interesting gat ending in captivating jugalbandhi. The way they moved through the stage was dramatic and at the same time the hold over laya came to the fore. There were captivating chakkars or spins based on drut laya. Dance for the couple seems to be a way of life. Time and again this has been illustrated by their varieties of Kathak performances. In the second number Shringara Rama, Nirupama and Rajendra gave a dignified and graceful version of love by dwelling on the sequence of Lord Rama and Seetha's first meeting. The bountiful beauty of nature (Abhisar in nature) was graphically presented by them. It is all, like a Varsha ritu (rainy season) river full of love flowing towards the ocean, its last destination, with zest and while doing so enjoying the elements of nature reminding the abhisarika nayika. And the same river in summer (Greeshma) reminds one of the plight of a virahotkhantitha nayika. The enactment of the romantic verse with delicate gestures and brisk movements as they vacillated between moods was applauded. Nirupama did well to create awareness about the laya by involving the children present in the audience through clapping in different patterns.